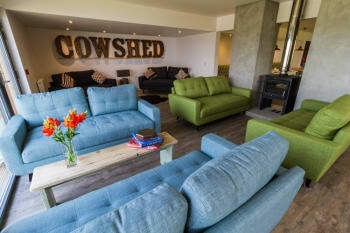 The Cowshed is a new type of "Boutique Bunkhouse" where the traditional world of Backpacker Hostels meets with a contemporary and luxurious amenities you would expect in a Boutique Hotel. For example all the custom made Bunk Beds have reading lights and individual power points for charging devices and a curtain for privacy. Each bathroom has a power shower, toilet and sink and with at least one bathroom per room there should never be a wait. The main living space has a large wood burner, stylish kitchen and eating area with stunning views from all the windows of the beautiful Island of Skye. Children: Children aged 3 or over are welcome. Groups: Groups are accepted up to a maximum of 12 people. No stag and hen groups. We loved the location and the common spaces, and the children enjoyed the pods. We stayed in a pod for three nights. Everything was perfect. We enjoyed the common spaces since we traveled as a group with 2 other families. It was very easy to gather for lunch. The staff is welcoming and always there to help. We didn't want to leave ! Nous avons adoré cette nuit dans un pod surplombant Uig et son loch. Le staff est adorable, les parties communes propres et grandes (mention speciale pour la cuisine et tous ses équipements). Bref, adresse géniale !! A total gem of a place, I'm so glad we booked here! Had an amazing stay at the Cowshed. Will definitely be coming back and telling all of my friends about this place! Absolutely amazing place. Beautiful location! Gorgeous views! Superb facilities, perfect accommodation. Everything was perfect, sparkly clean, warm and great cooking range. Very warm and cozy place! Love it! Will surely go back whenever we visit Isle of Skye!!! Quiraing is a place for great view, just nearby! And driving around the north to the kilt rocks, lovely drive!! Just the best. Comfy bed, nice shower, good location, excellent view and surroundings, super friendly staff... Whenever we return to Skye, we’re staying at The Cowshed again. Thank you! This bunkhouse is amazing. All the staff was helpful and Jackie, the manager, did everything possible to make my stay a very happy experience. I was able to hang around on checkout day while I waited half a day for a bus. This is the best bunkhouse/hostel I have ever stayed in. Everything was super clean and bed very comfy and cozy. I can't recommend highly enough. You really have to try it for yourself. I only stayed one night but Jackie has a list of walk locations in the immediate area. It's a beautiful hostel and I would like to stay there again anytime. The only tow tiny things that could be improved would be the wifi which unfortunately doesn't stretch all the way to the dorms and maybe a shelf to put things on. The Rah waterfalls are just a quick walk from the Cowshed and there are other beautiful walks as well. The pods are more spacious and comfortable then the pictures show. Plenty of room for 2 people with a lounge that can be pulled out as a bed for a more comfortable chilling space. Warm and toasty with all the basic creature comforts inside the pod itself. Loved our stay and would absolutely come back again, staff are friendly and welcoming and we felt recharged after a night in oasis! A full kitchen is available in the shared area for cooking (at set times). The pods have a microwave, kettle and mini fridge. Very nice location with a very good atmosphere. It looks like "new" so congrats to the staff for their good job. We were blown away. The Cowshed definitely exceeded our expectations! The only complaint was that for middle-aged backs, the beds in the cabins left us with sore backs each morning, but it's not a big deal. Everything was so clean and fantastic. Our kids loved the place and the staff. At first we were worried about the location - being so far up north on the island, as we were doing a lot of driving, but it turned out to be the perfect location for all of our desired treks! We were very happy with our choice. Go to the Uig Hotel for a meal! It was one of the best meals we had in Scotland. The cheese plate of local cheeses was excellent. This was such an amazing place to stay! The staff were so friendly and helpful, the kitchen was well equipped and a great size to be able to make our own meals. We loved the pod we stayed in, so comfy and clean! The views from here are stunning. The Fairy Glen was 5 mins from here and was a must see! This is probably one of the best hostels I've ever stayed at! OMG the bathrooms are the best. Best hostel bathrooms in the entire world. The water pressure was amazing and there was so much space to put your stuff and kinda feel home away from home. The lounge and the kitchen are really well equipped an modern. The view from the lounge was amazing. Would definitely recommend the place! Fantastic bunkhouse. Beautiful, tranquil location. We loved staying in our pod but also liked we could use the shared facilities to cook meals when we wanted. Dog friendly was a huge bonus and we would definitely return and will recommend to others. The Ferry Inn was sensational for dinner. It’s a definite must go place to eat! Lots of walks in the area, fairy glen, fairy pools, old man of storr, neist point and coral beach. All were accessible and easier walks I managed to do at 7 months pregnant! hope kitchen can use from 07:00-22:00,it's will be better,or writes about the kitchen use time on your internet. 1.there is a crazy beautiful ocean views in the kitchen and lobby. 2.the hotel is near the bus station, but you need to walk a little climbing to hotel. 3.the service is very good and patience . 4.I recommend here. Very good place to spend a night at a different place! It was perfect space use and very cozy! Too bad it did not have a mini stove so we can cook there and a tv for entertainment. Nevertheless, it was great we loved it! Warmed floor was very nice! Very nice hostel woth super kind staff. Great place to stay. My family had an entire room, with 6 bunk beds. Community bathrooms were amazing. So clean! Great shower, heated floors. Amazing full kitchen available for cooking. We only stayed one night. Would have loved to stay a week. Hiked Old Man of Storer. Hiked Quirang. Went Canyoning. Our guide Gus was amazing. A must do!! So much more to see and do. Wish we had more time there. My one small critique is that the internet was a bit slow overall and did not work in the room we had (#1) at all. Otherwise this experience was just delightful. We loved it. It was unique and just so fun. The Uig Hotel down the road had a great dinner and drinks. We had a great time there mingling with other travelers and locals. Buses do not come often but hitchhiking in april worked amazingly well. Everything about the Cowshed was great. Uig Hotel does yummy food. Would definitely recommend. Lugar acogedor limpio y bien equipado con un equipo atento y amigable. Entire stay was lovely, only comments are that on checking in there was no one at reception and we waited about 10 minutes. Another time we came to reception and there was no one there, we rang the bell twice but no one came. Both times were during opening hours. It didn’t matter to us too much but just so you have the feedback, maybe the bell wasn’t working? Every other time stafff were there and very friendly! LOVED the drying room, thank you so much! Thank you so much for having the Fairy Glen and Rha Falls on your information sheet in the pod. We would have missed these had we not read this. Visiting Skye for the second time and it's the second time at the Cowshed! Amazing luxury-like hostel with incredible views and amazing facilities. Fabulous as always. Will always stay here if in the area. Clean, Amazing view from living room, rooms are small and cozy and each bed has its individual light and plug and curtain which allows for privacy. Lockers available in each room which are big enough to fit in your rucksack. Kitchen will well equipped and although busy, you'll ways find space to cook and sit. The Fairy Glen is a 5 minute ride from the hostel and it is worth a visit. Rankin shop, just down the road from the hostel, has everything you need and a good selection of vegan products too (close on Sunday like many shops and restaurants on the island). Extremely clean facility, and staff very friendly and welcoming and willing to help. Loved the shared space, fantastic cooking utensils with plenty of space for multiple people to be cooking. Brewery is ok, but isle of sky chocolate was fantastic! Small little shop out the back of their house, but the service and customer interaction set them apart. Asked them for recommendations and the husband came out with his maps to show me some hidden gems of the town. Plus the truffles were delicious including the vegan ones! Joli "pod" avec belle vue sur la baie d'Uig. Pas très grand mais tout le confort nécessaire pour passer la nuit. Le restaurant de l'hôtel Uig a quelques minutes en voiture est très bien pour dîner. I'va been to lots of hostels but this is the best so far, the shower/wc are amazing for a hostel (even better than some 3 star hotels) and really appreciated the beds (with the cuetain). The kitchen is very good, really I don't know what to say except that it was great! Super original, super clean, super comfortable. The staff are great, the views are fantastic. Second time here and I would chose it again no doubt. Restaurants in Uig arent many, but there's one 5 min away from the hostel. Fairy glen nearby, and everything around is beautiful. Very friendly and helpful staff, warm cosy Pod was fabulous. Facilities are very clean, in great condition and all you could need. Great hostel especially for the price. Super nice bathrooms with heated floor, kitchen with a lot of space and everything you need to cook, little curtains for each bunk bed to have some privacy. If you are by car, would definitely recommend the Old man of Storr walk which is not easy but really nice. Accessible by foot from the hostel would be the Fairy Glen. Uig hotel has a nice haggis. Could not recommend this place enough. The best place I have stayed so far during my month long travels of the U.K.. The staff were very lovely and helpful, everything was super clean, great common areas (including a cosy wood fire), comfortable beds and the shower pressure was amazing (exactly what you need after a day of hiking). Very nice boutique hostel. Big and nice bathroom. Clean beds. Great lounge area with fireplace. Excellent place to stay. Clean, warm and great staff. If you're anywhere in the north of Skye, definitely do stay in this hotel...uhh... hostel. This place is the best! Big, clean kitchen, heated bathroom floor and even a socket and light near the bed! Definitely check out Fairy Glen, just down the next road. Best hostel I ever stayed ! Really happy with our stay - the facilities are great and the staff really friendly. I loved the pod we stayed in - well put together and clean. My one negative comment (though I'm not sure how fixable it is), is that the bathroom extraction fan blades flapped about a lot and it was a bit noisy at times -I found it hard to sleep one night, so you may want to bring earplugs. Uig hotel is good for food. Definitely try and find the dinosaur prints at Staffin - very exciting! Excellent hostel in every way as long as you don't have heavy bags to get to the ferry terminal and cannot get a lift! Always book direct for the best deal. Always very willing to accommodate us and our travel restrictions, very accommodating. Greatest place we've been in Scotland ! Nice and welcoming staff, great view from the common room, the rooms are cute and we particularly loved the warm floor in the bathrooms ;) It was a pleasure to stay, the kitchen is perfectly equipped, as for the common room it was relaxing with its games, fire and couchs. Thank you ! I consider this one of the best hostels I have stayed at. Contributed to the very helpful and friendly staff, the stunning views, and the comfortable accommodations. Because it is on the isle of Skye, the cheapest option would be buying groceries before arriving, but the local grocer is within walking distance from the hostel. My only feedback was that in the morning there was foreign radio on that made me want to leave early, not only could i not understand it but it was hectic and not very Scottish, this showed a lack of understanding about there being guests there who would be affected by this. Great location, friendly staff and amazing pods! Only feedback is that the pillows were lumpy. We had a great stay! A great stay with a great view. Very clean and welcoming. Go and walk at the Quiraing - amazing! Lovely staff, very clean and tidy pod, amazing and stunning view! Would recommend to everyone! I will organize another trip to the cowshed for sure! Very friendly and helpful staff. The bedrooms, kitchen and bathrooms were spotless. An excellent bunkhouse, modern, clean and spectacular views. Ideally located for the ferry port at Uig which is two minutes away. The pods looked great as well. Highly recommend. Remember to bring food as there very limited options in Uig. The Cowshed sells basics such as pasta which can be cooked in the excellent kitchen facilities. However given the limited options, it would be best to bring your own food or pick something up in Portree en route. A lovely place to place which was very modern and clean. Good facilities and lovely staff. Go climb the old man of storr! It was lovely, the staff was funny and friendly. The beds were comfortable and the bathrooms were awesome. I would definitely come back! I'm not usually one to write reviews, but this place is worthy of a review. Upon arrival, I was greeted by a very cute and friendly girl called Tui. Tui was very welcoming and gave me many recommendations around Skye and greater Scotland. The rooms here are amazing: clean, quiet and comfortable. The facilities here are even better but neither can beat that view. This place is an absolute bargain, I wish I could have stayed longer. Do yourself a favour and stay here while you are on Skye. Looking forward to my next stay. Absolutely stunning location, the staff are so friendly and welcoming. I can’t complement enough, everything about the Cowshed scores top marks. Thank you for making my stay such a treat. Perfect location for the ferry crossing to the Isle of Harris, fantastic scenery. Well our stay was out of season so the local inn down the rd that we have eaten at on our previous stay was closed. we brought along some food and used the microwave in the pod to make our dinner and breakfast. WiFi only available in the main building so bring a book if staying in the pods. Extremely freindly staff. i dont think i could have been made to feel more welcome. Once again a faultless stay. Staff very helpful especially when I left some items and had to call back a few days later for them! Access road also repaired and much better than last stay. Super handy for Uist and Harris ferry, no need for early Inverness or Glasgow departures! The staff are friendly! The pod is well kept and clean. Would be better if there’s wifi in the pods. Overall the stay was great! The Cowshed is a fantastic place to stay! It is very well laid out with immaculate facilities. The staff are super helpful and welcoming giving it a relaxed and homely feel. This is one of the best places we have ever stayed on Skye! Cosy, sparkly clean and very comfy; bathrooms are more from a 4 star hotel than a hostel. We enjoyed cooking our dinner in a perfectly stocked kitchen and then spent a lovely evening in a comfy sitting room, beside the fire. I loved it and I'm sure we will be back for a longer stay! We only stayed one night on our way to Outer Hebrides so we haven't had a chance to look around at other things to do. Fun place to stay. The pod was a bit cool, which some may find challenging. I wish the the wifi range was up till the rooms. Thif you're reaching after 6pm, better to carry your supplies to cook dinner and breakfast. Bring your own food but don't hesitate to cook. Kitchen is very well equiped. Fantastic welcoming family friendly accommodation. 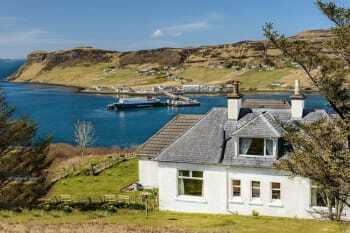 Clean and well furnished and easy access to UIg ferry terminal . A home far from home It was a pretty decent stay. the rooms are very comfortable, clean and cozy. The kitchen was very well equipped and very clean. The pods are great, clean and comfortable. The showers are more akin to a 4-star hotel. The wifi is really horrible and the coverage is only in the lobby and there's zero coverage in the rooms and also no GPRS services (Vodafone) available in this location. They run a store where you can buy noodles, kinds of pasta you name it but it's very expensive. Please improve the WiFi coverage to rooms as well. It is the third time I have stayed here and once again I have feel at home. Everything there is just perfect; bunk beds with curtains that allow you have privacy;modern shower rooms;a stylist open plan kitchen and a cosy living room with fire;and finally ,"the view" is a plus. But, if anyone want more privacy, the pod is an excellent option mainly for couples, nevertheless I suggest to share kitchen in the main, that could be one of the most interesting moments during your stay. Finally, the staff never, never disappoint you. They are helpful and efficient and if you have the chance, lets them chat, some came from overseas and they have amusing things to tell. Excellent really enjoyed my stay. I will be back and would 100% recommend! Well what can I say except that it was just great at the Cowshed! The staff was super friendly, always up for a chat and recommendations. The room and bathroom super clean and modern. Especially the shower was super great! The kitchen was also very clean and it has everything you need. Would definitely stay there again! The fairy glen is close to the cowshed and you can do some nice walks, hikes from the Cowshed too. Portree is just 20 mins from Uig with a lot of pubs, stores, cafés etc. Loved the pods, everything that we needed was there. But especially good as traveling with children, and when we spent time in main bunk house kids were welcomed and could play with games in corner. A true godsend for any parent! Don’t let the time of year put you off. Winter, so some things closed, limited daylight, but had patches of rain and clear sky. Was beautiful. Beautiful hostel with stunning views and facilities. Spotlessly clean, great little shop and lovely, very generous staff. Uig harbour walk, Fairy Glen, bus 57A/C to the Quiraing hike start, Duntulum, Old Man of Storr etc. The bus route itself is stunning! Loved everything. A really beautiful place. Wir waren 2 Nächte im Dezember in einem der Cowshed Pods. Die Lage ist absolut atemberaubend. Bei der Ankunft wurden wir sehr herzlich empfangen. Das Personal war sehr freundlich. Die Unterkunft war sehr sauber und kann von uns nur wärmstens weiterempfohlen werden. Vielen Dank an das The Cowshed Team!!! What an amazing place and great staff. The bar has been set very high. Hoping to go back in the not too distant future. This place is just fantastic, so clean and fresh. Love the individual curtains on the dorm beds! The facilities were really good, plenty of space and comfy lounge area with fire ,(much needed with isle of skye weather). The staff were really friendly and nothing was too much trouble for them. Will definitely recommend! Don't be deceived in to thinking you need to stay in portree for your isle of skye adventure. I visited the storr, quiraing, isle of raasay and the fairy glen all from this hostel. Staff are always friendly and helpful.this is one of the reasons why I visit this hostel several times every year. Beautiful location. There are several places to visit close by. It is worth taking your own food, to cook your meals in the very well equipped kitchen. Very comfortable throughout. Wow, What an amazing stay I had at the cowshed!! The first night i slept at a cod, which was realy cool and nice to had some private space. The vieuw was also amazing! You could also use the kitchen, which is an incredible place with everything you need. Stayed for another 3 nights in the hostel. The hostel is so clean, the beds are comfortable (was happy with the curtons, nice touch), the bathroom spacious and had floorwarming and the common space is incredible with relaxing couches and a fireplace <3 The vieuw is super nice. Think it is the best hostel I ever stayed at!! The staff is so friendly and are helping you out if you have any questions!! It was soo nice to hang out with Hanna and Pierre on there day off, had such a fun time with you guys!! Like you say Hanna, felt like I was a little part of the cowshed family ;) Thanks again for everything, realy recommend this hostel to everyone!! Great staff, great location and excellent facilities! Such a cute hostel and lovely staff. Fantastic facilities and the view is incredible. The best shower I’ve had since being in Scotland. Wished we stayed here longer than one night! Pues todo muy bien, muy agusto y volvería sin duda. Antes de alojarme tuve mis dudas. Veía que el alojamiento estaba a bastante distancia de la parada de bus. Aún así me decidí a ir asumiendo que tendría que caminar unos 3 km a la llegada y el día de salir. Al llegar me encontré con la grata sorpresa de que todos los autobuses te dejan directamente en la entrada del Hostel si se lo pides. Creo que está información es útil para las personas, que como yo, vamos en bus y no en coche. What a wonderful experience!! 5 Stars accross the board. The staff was so sweet and helpful!! Didn’t want to leave!! Would love to come back and stay again!! It’s a special place, beautiful views, comfy cabins highly recommended. Don’t miss Fairy Glen, is so close and beautiful! This place is pure gold. Located a top of a hill with a breathtaking view. The place is pristine, clean and very spacey. The bathrooms have floor heating! Bunk beds have curtains to help with the privacy. 10 / 10 for this place with great prices per night at such a busy island. Make sure to check our Fairy Glen - gorgeous landscapes nearby (20 minutes walking) to the east from the hostel. This is NO reflection on the staff, because they were wonderful and could not do enough to have everyone have an excellent stay there, but there was no wood for a fire in the evening. My guess is that you put out the wood and have big fires every night.You would have to ration it for more people to enjoy at least some of an evening fire. I have traveled to many places around the world and your hostel is a 5 star +!. I can't even begin all the beautiful amenities, from the spiciness of the dorms to the heated floors in the huge bathrooms. Uig Hotel is close to the cowshed and has a very nice pub and restaurant! We spent the night here at the last minute after our ferry to Harris was cancelled. Lovely environment and views in both the pods and the social area. Really friendly staff who couldn't have been more accommodating. I will definitely be recommending to friends and family when they visit the area. Go to Sparr cave. Add an extra day. Explore. Very friendly staff that greeted and welcomed my friends and I the moment we stepped inside. Everyone was nice and went out of their way to help accomodate us. This is the best accommodation of its type that we have stayed in. Immaculately clean with all the facilities you could need. The staff were polite and very helpful. We would not hesitate in using the Cowshed and its Pods again. There's plenty to see and do. The staff will give you sound advice. Thank you so much! Easily the best hotel I've ever stayed in. We had a wonderful stay, the facilities are amazing and don't get me started on the view! Thanks! We had a great stay, the pod had everything we needed and was very clean. We wished we had longer there. The reception staff were helpful and friendly. The only downsides were that the bed was quite uncomfortable, the fridge hadn’t been turned on and there wasn’t any milk left for us for tea and coffee. Otherwise very good thanks. Highly recommend the food, drink and service at Uig Hotel. Worth stopping by the Skye Brewing Co shop to pick up some souvenirs. One of the best Hostels i have ever been!! You guys are awesome! Everything was clean and the staff was very nice. And the view from the cowshed to the Sea and town was beautiful. If I ever come back to skye I am sure i will stay in the cowshed. You do an Amazing Job guys!!! There is no „ugly“ Place on this Ilse it was absolutley amazing. There ar so many things you have to see the man of stor is so impressive and the view is absolutley amazing. But if you want to see many Things as possible in a short time you should have a Car. Wonderful place, very nice staff, very nice with the oven in the evening. The service has been great. The place has everything. The kitchen allows for visitors to cook their own food. There are board games for entertainment and the shower facilities are great. Comfiest mattresses ever - wonderful night's sleep. Very friendly staff and excellent facilities. Highly recommended. Awesome view and facilities. Very clean with lots of space. Dorm rooms had great privacy and storage! 100% would go back. Heavenly! Owen and Nikita are the most welcoming and wonderful hostel receptionists ever, they make the place so homely and wonderful! We stayed in the Cowshed Hostel just for one night. Though, we wish we could stay longer. Everything was top notch, the facilities super modern, the place was astoundingly clean, the lounge was beautiful, and the best thing was the atmosphere. Really everything was 10/10. Shout out also to the friendly staff members that made it super easy for us to check in even though we arrived pretty late. If you find yourself in isle of skye, don't miss the opportunity to stay here! Unfortunately, we only had a day to spare in the island, which meant we didn't have the time we wanted ty o explore everything. Though, we started in Portree and hitchhiked our way until the fairy pools where we spent a couple of hours hiking. We also came across a beautiful path close to the fairy pools where we hiked as well. In general, the scenery is breathtaking and people in the island extraordinary. So, don't be discouraged by the lack of public transport in the island, just go for it and you will certainly find your way around. Go in summer. Views were great but imagine spectacular in beautiful weather . 5***** Facility but *thought* needs to be put into the parking or signage. unsuitable if you arrive in the dark there are no lights and cunningly placed obstacles and a fully grown huge lifelike statue of a Highland cow 35+ cars and no light no demarcation no turning circle. Have to say the poor receptionist is worth his weight in gold and needs an intimidate pay rise put overtime in a howling force 7 westerly above and beyond to hep us turn. so all in all a fantastic 5***** facility just outside Uig so handy for folk from the Outer Isles but ...please someone put thought into parking as folk from the Isles usually drive large cars or vans, Maybe we missed it but had there been a sign at the bottom of the hill saying cars only we would have ventured up in our van. This is not a complaint about the road up , just some comments on the parking and lack of turning space. A fabulous, dog friendly place to stay! Lovely accommodation and great communal area! It has everything you could need plus helpful staff! Close to the Quiraing which is a great walk! Perfect as a base to explore Skye. Loved our pod which was clean, comfortable and cosy. Communal kitchen/living area was lovely and always clean any time we were in it. Staff were friendly and helpful. We will definitely come back! Absolutely fantastic ! First time visiting Skye and will definitely be returning. Can't believe the quality of the facilities and how clean the rooms are. The little shop is a nice touch too and was great for the small essentials that we forgot ! Thank you for a lovely welcoming stay ! Love love loved our stay at the Cowshed!! It was our first hostel experience and it could not have been better! Our only regret is we couldn’t stay longer! Beautiful place and location. Clean environment and friendly people and staff! Thank you for making us feel so welcome!! It’s a must stay!! We were there unfortunately off season so not much open for restaurants. But a definite must is the walk to the fairy glen!! Amazing!! Most modern and clean hostel I’ve ever stayed at. Great service and adorable pods. Go see the surrounding walks that the staff suggest! My son and I would love to stay another time again and than for more days. What a wonderful utopia. We wished we were staying there all week. Those pods have a shocking amount of room and so cozy. We wanted to move in. Keep up the good work! Hang out in your pod or on your deck as much as possible! Lovely, cosy environment for a nights stay with comfortable and welcoming common areas. Staff were friendly and helpful on our arrival. Had dinner at the Ferry Inn (was recommended this is to be booked in advance) and would highly recommend if in the area. The food was incredible and service was top class and the decor and atmosphere were both lovely. The dinner at the Uig hotel is very good! make reservations at sundays, as this is the only restaurant that is open at sunday evenings. Great place to stay. Staff lovely, facilities, decor, atmosphere excellent for kids and adults. Only downside is quilts were a bit old. Cracking stay and location. Road deteriorating but looks like it is in hand. Excellent location, very authentic pods with great see view. Nice personnel. Very comfortable common facilities (kitchen, living room). The Cowshed is a lovely hostel with excellent facilities and I have now stayed on 3 separate occasions. There is a bus service to and from Portree. An experience i will never forget, waking up to a beautifulk scenery in a amazing cowshed top of the art. Lovet it. The Hotel next door has excelent meals, not too expensive. The Cowshed is perhaps the best hostel I've ever stayed in - clean and comfortable with a spacious kitchen that is great for cooking in. We appreciated the laundry room with washers, dryers, and room to hang clothes as well. 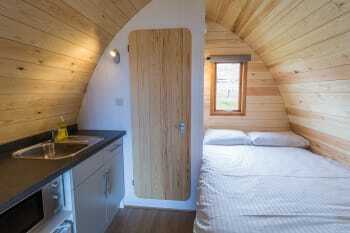 Fabulous short stay in a well kitted out pod. The facilities in the main building were great. Lovely and cosy pod. Clean and tidy. Very helpful staff who showed us all the facilities that we could use. Fab location. It was my second stay at the Cowshed and I still enjoyed it the same as the first time! Perfect service, fantastic location and the pods are so cozy! UIg is a great spot to visit the wild side of SKye (Fairy Glen, Quiraing, Old Man of Storr). The pods at the Cowshed provide for a unique touristic experience! Really nice location. Would fix the road leading up though as it's full of potholes. The Ferry Inn restaurant is really recommended. We stayed in the Pod ... which we found very cramped for us. We went to the hostel to shower at night as we found it hard to keep the floor in the small bathroom dry & we were worried about slipping on the toilet floor during the night !! The bed proved hard for us to get out of during the night ... to have to climb over the over person to get in & out of bed !! We are 69 & 70 !! The Uig hotel was great to have meals at. Plenty of walks & drives to do around the area. We booked little huts called pods. I can just recommend this place. Little pods contains all you need (bed, sofa, small table with two chairs, little kitchen equipped with basic dishes with microwave and refrigerator, and of course small bathroom). In case you want to do big cooking you can use kitchen in common area. It is really big kitchen with all you need for cooking (stoves, pots, big refrigerator). There is just one thing which could be improved and that is the road which lead into the place. It is in bad shape right now with big holes and you have to drive really slow and carefully. But otherwise it is perfect place for your stay. I have stayed twice at this hostel and love its beautiful location, the kindness and helpfulness of the staff, the great facilities including the well equipped open plan kitchen, dining tables and comfortable relaxing areas looking out over lovely Uig bay. The showersand toilets are spotless, have underfloor heating and are the bested most luxurious I have have ever experienced! the Uig hotel is a lovely place if you want to go out and eat or for a drink and just 5 minutes walk away. The lovely Fairy Glen is just about a 25 minute walk from the hostel. It is a steep lane that winds up from the main road to the hostel so take care if driving up. One of the best hostel I've ever been to. Lovely views and facilities, friendly staff,good value. It was the best place we stayed in our entire trip to Scotland. A real sanctuary. The staff were really helpful. A really interesting mix of guests. The communal kitchen, dining and relaxation areas make for a good environment to meet others. Try the pub in town. This is the nicest hostel I have ever stayed in although I do not often stay at hostels I was quite happy here. Lovely friendly large communal area with lots of comfortable places to relax and enjoy fabulous views from picture windows and the veranda area. Great kitchen facilities. Staff are so helpful and friendly. Dormitory beds are very comfortable with plenty of beautiful bathrooms. Ferries leave Uig for Uist and Harris and bus service to Portree and onto Ft William. Very good food at nearby hotel. A fantastic place to stay - Staff are very friendly and extremely helpful. Nothing is too much trouble for them. I have stayed 3 times now and will be back again - hopefully very soon. Our stay was on a Sunday so we would recommend booking at the Uig Hotel for dinner if you would like to eat out. The food was lovely but they get very busy as it appears the only place open for dinner on Sundays. Good little dog walk down the Rd through the woodland too. We stayed for 2 nights last month and absolutely loved it! The Cowshed was immaculate, comfortable and felt safe (a massive bonus in shared accomodation!). The bathrooms were spotless, living area, kitchen and bedrooms were clean, comfortable and warm. The staff that welcomed us (Jackie and Glen, if I remember right!) were lovely and helpful. Would highly recommend The Cowshed to anyone that would listen! What a wonderful place to stay. It is more than accommodation, it is an experience. Beautiful location, the view is amazing and unique. The hotel is very modern, the bathrooms were big and private and the kitchen is perfect. Just sad that there is no breakfast organized in the morning first because it is nice not to have to buy everything individually and second because I like the atmosphere in the morning when everyone is having breakfast around the table. Don't forget to get your own food, there is no breakfast and no restaurant near. Near from the Fairy Glen, a must-see in Skye. The cowshed hostel is a very nice place to stay , everything you need is here , the staff is always helpfull and nice . The view from the hostel is amazing ! The best hostel ever!!! All is exaxtly like in the description Beautiful decoratet/beautiful view Spotless clean Nice staff Why can't other hostels not be like this one? Perfect! Great staff - Jackie is great! HARD TO CLIMB UP HILL TO, OFF BUS THAT GOES THERE FROM PORTREE. BRING FOOD, AS FEW RESTAURANTS ARE OPEN IN FALL SEASON. IT IS FAR WALK TO OTHER THAN hotel WHICH IS CLOSE, BUT LIMITED TIMES. The most beautiful boutique hostel ever. 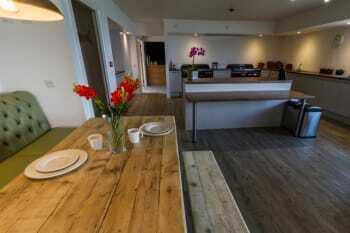 Kitchen si soo big, shared room with sofa is perfect and staff is very very nice. We loved our stay and hope to return soon! Both the Uig Hotel and The Ferry Inn are dog friendly, either for a drink or food. The local shop is like a labyrinth, with different departments around every corner. They have most things that you would need if you were cooking for yourself. The Fairy Glen is a good, undulating walk from the Cowshed: definitely worth a visit. Unfortunately, the weather wasn’t good during our two night stay, therefore it restricted what we did. Stuff was excellent. One of the most beautiful Hostels, i stayed. Just excellent. Very welcoming staff. The communal kitchen facilities were immaculate. The views superb. Our wee doggie was delighted with her stay in the pod and so were we. Lovely hostel with lots of nice sitting areas with beautiful outlook. Thoughtful facilities even in dormitory area and good bathrooms. Local hotel does lovely dinner at good prices. Immaculate pod! Not a spot of dirt! Comfortable beds! Warm! Fully functional for your needs overnight! Amazing views! With the amount of cooking facilities in the bunk house it’s worth cooking your own food! There’s plenty to do and there was plenty of leaflets in the bunk house reception of magical places! Loved this place! Everything was clean and comfortable. A great place to meet others as well, staff was very friendly. We had a lovely stay in one of your pod. We would recommed it to our friends! Thank you for being hulpfull and the great time! Bring your own food (as usual for this type of accommodation), some stuff is available on the reception. Coffee, tea bags and sugar were provided when we stayed there (09-2018). The only restaurant in Uig is in walking distance, you might consider booking a table in advance (that seems to be the case for any other restaurants on Skye, too). Ella's cafe on the left after the Skye Brewing Co. (down towards the ferry terminal). It's a great combination of homemade food (fresh scones out of the oven at 10ish AM! ), antiques, used books, and awesome music playing on. Best hostel where I ever stay. Highly recommended. I will be definitely back next year. High standards of cleaning. Very good location. Fabulous hostel, super comfy, large well equipped kitchen and common area was great with loads of sofas, seats, games, books and great views. Staff were really friendly and helpful. Individual shower and toilet rooms were really good, spacious, clean, underfloor heating. Great powerful hot shower. Would stay here again in a heartbeat! Well done team Cowshed! Amazing staff. They were very helpful for information about nearby hikes. Loved the facilities. Super cute place. Only suggestion is possibly a separate drying room from the laundry room just because of the smell. Loved how close it was to the Fairy Glen and Quiriang. the view from the lounge on the port of Uig is fantastic. the kitchen is large, spacious and has everything you need. the rooms are nice and the bathrooms are big and clean. the staff is kind and friendly ready to help you for anything. 10 minutes from the ferry. you can see at 10 minutes Fairy Glen,it not to be missed! Fabulous stay at the Cowshed, Uig. The staff were very helpful and friendly and the views from the lodge were beautiful. 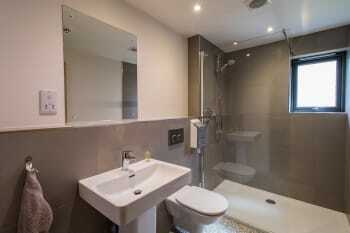 Small point to be aware of is that the en suite bathrooms are very compact however contain all the amenities required. We would definitely stay again and recommend to friends and family. Coasteering with Skye Adventure is a must do! It is the best hostel I have ever stayed in! Just ask the staff working there, they will tell you all you need to know and more! Beautiful location, wonderful friendly staff, excellent facilities, immaculately clean, warm and comfortable bunks, endless supply of piping hot water for showers and the chance to meet people from all over the world. What’s not to love? I only stated a couple of separate nights, but I know there is a hotel with a restaurant a couple of minutes walk away if you don’t feel like cooking for yourself. A 40 min walk will take you to Uig pier where you can catch a ferry on to North Uist or Harris and there is a wee general store at the foot of the brae that will provide you with all the wee essentials you might need. This is a top quality place to stay. I've stayed here a few times and I'm still impressed! Super Unterkunft, wir haben den Aufenthalt sehr genossen. Einfach nur Traumhaft!!! Clean, comfortable beds, good bathroom ,very big kitchen with all on board. Good view, avialable snaks and cold beer. This Cowshed was in a perfect location and we had such a wonderful stay! The pods were so cozy and lovely. We did have an issue on our first night when the water was too hot but they resolved it right away the following morning. The staff is so kind and responsive and made our stay so great! While other people might see the lack of wifi in the pods as a negative thing, I think it's a great idea because it pushes you to disconnect with the rest of the world and really experience where you are. The Fairy Glen and the Quiraing are right by the Cowshed so it's easy to knock those off the list. It's also a half hour away from Old Man of Storr and Portree so it really is conveniently located! We had an issue with the electricity in our pod where one of the lights was tripping the rest. It would have been good if the staff could have highlighted the issue as we were checked in. We understood that no electricians would come out on a Sunday! Otherwise, telling us where the spare bedding was for the pull out bed on check in would also have been helpful. All good otherwise - thanks! The Gull Cafe serves good food. Walk to the Fairie Glen rather than drive. Tout est tellement bien fait et bien pensé! Très accueillant, très amicale..je reviendrai vous voir assurément! Thoroughly pleasant stay. The pods are very comfortable. The boat trip from the harbour is very good and Fairy Glen is an easy walk from the Cowshed. The nicest hostel we have stayed in . Highly recommended! Isle of Skye is amazing place ! There are many things to do , to see , full of beauty. One of my top 5 hostels. The Cowshed is a one-of-a-kind stay experience, and I was surprised to find the actual pods incredibly well-designed. The floorboard heating kept us warm and cozy throughout the cold and damp night, and was effective enough to even dry some of our wet hiking gear. The facilities were clean, the bed was comfortable, and the shower was just a touch too hot but great water pressure. Enjoy the views, especially at sunset! Everything was great. I had to get used to the shower in the pods but after the first time it was fine. We had an excellent stay and were happy with literally everything. Make sure to bring some groceries, especially when you come over the weekend as the local store is closed on a Sunday. Excellent hostel with large open plan kitchen, well equipped for cooking family meals, and large lounge area, both with fabulous views. We stayed in a pod with our tall 13 and 11 year old daughters, cosy but perfectly formed. The drive up is in need of resurfacing, go carefully. We loved our 4 night stay and would return. The Ferry Inn in Uig is amazing for an evening meal, pre book. Boat trip with the company with an office near the end of Uig pier was very good - owner often out on trip, so call and leave message to book and he will call back to arrange. Excellent all the way, highly recommended. The only negative thing we see about your hostel is that the road to enter with the car is quite bad in which a car could be damaged. Fantastic Hostel - We had a great stay. Thank you. We stayed in a pod for 1 night. Comfortable and well-equipped, warm and cosy! I strongly suggest to book dinner in advance, if you want to eat in some local restaurant. 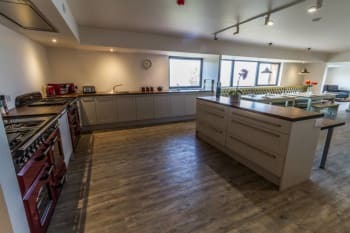 Otherwise The Cowshed has a very well equipped shared kitchen, clean and comfortable. We had a very nice staying at the Cowshed. We appreciated particularly the common facilities (kitchen, dining room, toilets) and the kindness of the staff. We recommend however to improve the conditions of the road to the Cowshed which, as you surely know, requires urgent maintenance. Espléndida ubicación, espléndidas instalaciones, bonito ambiente de convivencia y magnífica relación calidad-precio. El personal amable y atento, siempre nos facilitó nuestra estancia. La localización, cerca de muchos de los puntos de obligada visita en Skye. Nos alojamos todo el grupo en dos de las habitaciones de 6 camas. Hay que adaptarse a los horarios de uso de los espacios comunes, pero es algo lógico y no son nada restrictivos. La cocina, el salón, las duchas, la habitación de secado, todo impecable, amplio, moderno, difícil esperar algo mejor. My husband and I stayed here with 2 teenagers. It was excellent and my kids loved it as well. The beds were actually the most comfortable beds we slept in on our entire 16 day vacation. Everything was perfect. Just one staff member didnt know how to turn the heating on. This is a fantastic hostel. The standard of decor is very high and the view from the hostel was beautiful. The staff were friendly and helpful. The beds were very comfy with individual lights, sockets and even bed curtains. The kitchen had everything we needed. The only thing that we felt could be improved is a slightly bigger drying room, to cope with Skye's weather. We'd highly recommend this place. Great hostel. A step above most other places you'll find at this price point. It was a wondefull stay in your hostel. Outstandings views of Uig, great facilities. Rha Falls, Quaring, Fairy pool. Best hostel I've been in so far! Lovely place and staff, thank you. Thanks for making our stay so pleasant. Jackie and all the staff are so kind and helpful. The location is stunning and the pods were spotless. The Uig Hotel was very welcoming to us with our dog and the food was delicious. The Hungry Gull was great for veggie burritos! The Museum of daily life (on road to Staffin) was brilliant - even in the pouring rain! It consists of different crofts with exhibits inside and was very interesting about island life for crofters. Rha Falls is beautiful and worth a visit. Very very nice experience ! I've already recommended the Cowshed to two friends! I had a lovely stay thank you. Was made to feel really welcome by your team, and it was a great place to base myself for a couple of days. One of my best ever hostel experiences. The coal beach and the print of the dinosaure. I think this is the greatest, cleanest hostel I've ever stayed in. It has everything I dreamt of to have in a hostel and the vibe is just great. If you are commuting by bus, tell the driver that you are getting off at Cowshed. The bus stop is not very obvious but it's just 1 minute walk to the hostel if you get off at the closest stop. Otherwise from the pier it will be a 30min walk. From there you can walk to Fairy Glen which is quite nice to visit. Really lovely relaxed atmosphere ! Great showers and comfortable beds, social areas really welcoming. The uphill driveway is scary and can't imagine how you would get up in winter. Uig Hotel restaurant was great and Misty Isle Boat tours in Elgol is very worth trying. By far the nicest hostel in Scotland (or at least Isle of Skye). New and clean common room and kitchen, very comfortable rooms and beds and friendly staff. We enjoyed our stay very much. Fairy Glen is in a walking distance which is very convenient as you don't have to wait for a bus. One of the best hostels we've stayed at. Great facilities, friendly staff, very clean. We would stay here again. It's a perfect place ! When we arrived Owen was right there to get us organized. The pod was clean cozy and the view was lovely. Prior to arrival I gained alot of information from Jacki. The staff were excellent in helping us to understand how to get to Uig and the pods and helping us with understanding things before arrival as well as what to do after. Close drive into Uig. We ate at the Hungry Gull. Amazing home cooked meals!!! The Pier was very good. We tried to eat at the Uig hotel but it was very busy. Alot of people bought food and cooked at the Cowshed. Huge well equipped kitchen!! There is a grocery store in Uig and a smaller one by the Hungry Gull. A must to do is the 3 hour boat trip on the Radiant Queen with Tom and Duncan. Book online with Skye Cruise...info@skycruises.com There is a little booth at the start of the pier but it is best to book online. We saw puffins which was one of the reasons we went to Isle of Skye. The scenery is beautiful from the water. Saw seals many varieties of birds. You will not find anyone more knowledgable than Duncan and Tom!! They are so friendly and helpful!!! We did a drive around Skye. Owen showed us the maps on their board. It was very interesting as well!! We loved staying here. Even in a shared bedroom it felt like there was a lot of space and privacy. The Kitchen and common areas are cosy and decorated so nicely. Everything is so clean and the bathrooms are amazing.. especially for a hostel. Also the view of the sea is amazing. We loved getting to meet other travelers. It was one of our favourite nights of our Scotland holiday. We loved dinner and drinks at the Ferry Inn. Loved the proximity to the Fairy Glen and woodland walks. This was a great place to stay to see that part of Skye. We stayed here after coming from the other side of the island and stopping at major sites/hikes along the way. The next morning we drove to Skye Skyns and would have explored more, but had to catch the ferry. It is also a great location for taking the ferry from Uig to Harris and Lewis. Highly recommended, clean, cosy, comfortable, equipped w good essentials and good communal facilities if you want them. Very good value. There are good hotels nearby which offer good food if you don't fancy cooking yourself. Make sure you look Cowshed up on map - we had some problem finding it but once we called we got very friendly and good directions! Very nice, perfect place, clean, we would recommend this place, and might come back. really great stay a beautiful landscape I highly recommend A regret for me i ll have to buy your coasters to make me a memory !! Fantastic hostel. The staff was very friendly and welcoming. Firstly, I would highly reccomend you acquire more towels; there should be a sufficient quantity of towels for your capacity. As of August 4th 2018 your quantity is too low. I would also suggest that staff helps to maintain a comfortable environment for all guests. There was a large group that tended to overtake the common area making it uncomfortable for others. Lovely stay at the Cowshed. Facilities are the best in any bunkhouse we've stayed. Hope to be back. Uig Hotel is literally next door if you're heading out for dinner, however we opted for the Ferry Inn. Little further to walk but worth every step. It was amazing. Food was brilliant and staff very attentive. Thoroughly enjoyed our night in Uig. Great place to stay in North Skye, ideal for the Ferry to outer ilse. we really enjoyed staying with you and you do have a great concept. the staff was outstanding: helpful, smiling and competent one small thing to comment about: if it is great to have washing facilities, the clothes weren't reall y clean, the cycle is too short. I wish the entrance road could be a bit flatter and manageable : ) but everything else is perfect!! Fantastic location on Skye, the north is beautiful and returning back 'home" to The Cowshed adds to the experience. Very well laid out and comfortable, we could all relax and enjoy the views both inside and out. The Quaraing is well worth a visit including the approach uphill from the coast road from Portree on one of the best roads in Britain. What a view! This is the best hostel I have ever stayed in. The facility is purpose-built, so it is tailor made to be a great hostel. The common area is spacious and well equipped. The dorm rooms have box beds with curtains and personal electrical outlets. And the bathrooms are large, plentiful, and conveniently located. Do remember to reserve dinner slots at the hotels nearby if you want better food! The restaurants at the Hotels are packed. Semplicemente meraviglioso. Bagni piuttosto pulitie tanti per il numero degli ospiti, cosicché erano sempre liberi. Siamo riusciti a fare la doccia tutti e 4 in contemporanea. Meglio di un 5 stelle. Il soggiorno comune davvero un posto accogliente. Perdersinella meravigliosa natura di Skye. Riuscire a camminare nel Quiraing, all’Old Man e soprattutto il top Nextie Point. Our stay was very comfortable in the pod. The only thing that we missed was a bath mat to wipe our feet after a shower. That would be a great addition. Also, the approach road had many potholes which could be sorted out. Please install some mirrors so that it’s easy for uphill and downhill traffic to spot each other. Reversing on the uphill road would be quite tricky. The Fairy Glen was well worth a visit. I loved the stone formations. We absolutely loved our stay the pods are a little hidden gem of luxury. We will definitely be back to stay again. Great location. Friendly staff. Comfortable room. Excellent facilities. Fairy glen. Uig ferry. Hungry gull. Beautiful location. 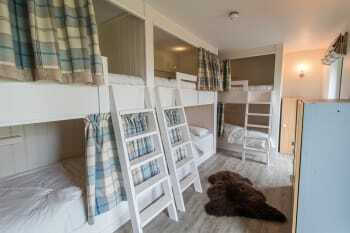 Very clean bunkhouse and pods. Very friendly and welcoming staff. There however should have been a warning regarding the narrow single track road and numerous pot holes up to the location. Bakur was lovely for food. Located on hill, need a powerful car to climb up, otherwise you have to walk up the slope ~2 mins. Excellent. Staff were approachable and friendly. Facilities were excellent and at a reasonable price. The best hostel we stayed in Scotland! A great place! Your staff was pleasant and professional, they are an asset to your business. Good location, great value. Clean and comfortable. Check out is too early. Industry standard should be in for 2 out for 12. In for 12 out for 10. In for 4 out for 10 is a 6 hour turn around. Although I was told you can check in to dorms early, this was not made clear and it's still 2 which is a 4 hour turn around. Minor complaint, I would return. Within short drives to the majority of the sites on Skye and minutes from the ferry terminal. Staff were so friendly and informative. Showed us where everything was. The hostel is so clean and the kitchen was equipped with everything we needed. 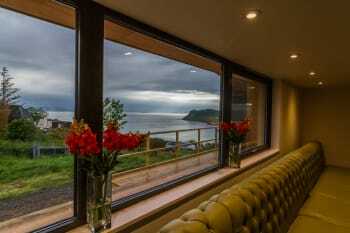 The lounge area had the most amazing view I have ever seen in my travels around Scotland. It is a new facility so even the dorm beds were so comfortable and they even had lockers available to lock up your belongings. I would highly recommend this place. Definitely a great place. Very comfortable (a little bit noisy though: you can hear the door to the kitchen open and close constantly from the room). Very friendly staff. The kitchen and living-room are fantastic! One of the best hostels I've ever stayed in! Thanks so much! Uig Hotel, 5 mins walk away, served us an excellent dinner. Very well run place. Such a fantastic place to stay - lovely welcoming feel and atmosphere in the communal areas. Great location for overnight stay before getting the morning ferry to Harris. The staff was wonderful, friendly, helpful. Most appreciative to Owen, who helped me with so many details that would have been stressful otherwise. He helped me figure out bus, train, and overnight accommodations after leaving the Cowshed. My travels were much easier thanks to Owen. It’s a perfect location for the ferry. The pods are very well equipped and the shop at reception provided everything we needed for an overnight stay. Really nice place! The view is amazing ! Très bien équipé et vraiment très propre, les parties communes sont tops !! el STAFF muy profesional y atento. please fix the road. it is quite bumpy. Very comfortable...expertly managed and all nine of us really enjoyed our short stay. The eldest of our party was 81 and the youngest was 6 years. Thanks very much. Thank you to the very welcoming staff. Very impressed with the hostel again on my second stay. Will be back! Fantastic place to stay, wish we'd booked longer! Will definitely be making the effort to visit Skye and the Cowshed again in the future. Fab location great staff and very comfortable pods. Walk to Fairy Glen well worth the effort. Lovely clean and refurbed hostel. Beautiful view over Uig Port and so close to beautiful Fairy Glen! Pleasant staff and very reasonably priced. Love the little curtains on the hostel beds, creates a little sense of privacy and helped me sleep, other hostels could learn from this. Really enjoyed our stay and would definitely recommend. 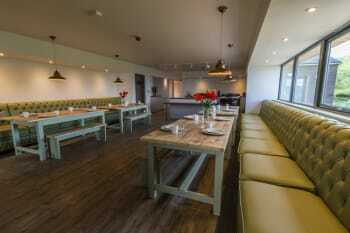 Food was delightful at Uig Hotel just a 2 minute walk from The Cowshed. Definitely check out Fairy Glen. Can do shopping in Portree at the coop but nice also to support local shop Rankins in Uig, however obviously more limited with stock. Brewery was not quite what we expected coming from Australia our breweries are places to sit down and enjoy yourself a beer, this one is more a retail shop, can do some tastings but really is a small retail front. Everything but for the winding road up to the Cowshed was fantastic. The asphalt could use some renovation. Uig Hotel was rather posh and somewhat uncomfortable because the staff was rather tense. Best to stock up on Thistly Cross and spend the evening with homecooked food at the shed. We absolutely loved our stay (one night in the dorm, and one night in a pod). Both were clean and very cute!! The views are amazing and the staff was very helpful and nice. The amenities were great as well! Our one tidbit for growth would be proper mattresses in the pods, not the futon type. We still very much enjoyed our stay and would definitely come back! If you love adventure and hiking then The Old Man of Storr is a must, as well as the Quaraing (different views but both outstanding- the Quaraing was a slightly easier hike as well compared to Storr. The Ferry Inn was a super cute place as well to just go for drinks or a nice dinner, just down the road from the cowshed as well! Beautiful views from our small but perfectly equipped pod. The communal kitchen and lounge areas are equally lovely. Only stayed one night because passing through but would have liked to stay longer ! The Quiraing area is amazing ! Stay out of ferryboat inn. Our stay was fabulous, great location with beautiful views. Pod amenities were more than expected, very clean with great service, pod was roomier than expected for 2 adults and a child. The Ferry Inn nearby was great, had a lovely meal. Fairy Glen down the road was lovely on a summers evening. Perfect location in the north of Skye. In terms of shared accomodation, this was absolutely top notch. The facilities were great and clean, the view was incredible, and Jackie is so pleasant and a wealth of information. If you enjoy hiking, do not miss nearby Quiraing! A modern, well-run hostel. 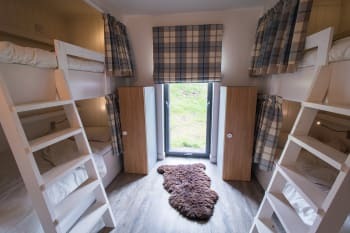 The bunks have curtains which is a nice touch, and everything from the showers to the kitchen is top quality, friendly helpful staff too. A great place to stay for everything around Uig, and a quick downhill cycle to the ferry! Friendly and helpful staff made us feel very welcome. The hostel is immaculate with a well stocked shop and free tea and coffee. The beds are comfy, there is a decent light for reading and a privacy curtain to block out the light. Having a socket to charge your phone beside your bed is a great idea! We only stayed one night as we were getting the morning boat over to Harris. It’s a great base for seeing Skye and it’s a hostel I’ll definitely use again. Fabulous location with incredible views. Stayed in one of the pods which was very cosy and had everything we needed for a lovely chilled evening. Loved the porch and great to watch the sunset. Also staff were very welcoming and friendly! Thanks for a great stay! A great base for the island if you have a car! The hungry full for breakfast was one of the best on our holiday so would recommend if not making it yourself! Everyone very friendly and helpful, clean and well equipped. A quirky and fun place to stay with amazing views and friendly, helpful staff. Lots to see and do in the area and cosy place to come back to at the end of a busy day sightseeing. Would definitely recommend a stay at The Cowshed. Loved the spot. Like the concept and the design of the main building and outbuildings. Architects to be complimented! Room we were in (1) not the best due to view and being on washroom walls. Lots of noise / vibration from closing bathroom doors. Install mutes on doors / signage. Better indications of washroom "Full" would also be helpful. Ca be interlocked with door latch. Best to show up fully provisioned. Hikers usually are / we were not. Could note that nearest full food provisions in Portree. Could note that Fairie Glen is a short hike. enjoyed our stay! Pod was very quaint. Clean and cosy. I could not believe what I saw when I entered the Cowshed. The rooms are incredible, the view is amazing and don't even get me started on the bathrooms! If this would be your first experience hostelling, you would be ruined. The Cowshed goed beyond expectations! I highly recommend this place! A luxury hotel at unbeatable prices. Functional and spectacular facilities. Perfect cleanliness. Totally recommended. a well organised environment very suitable when travelling with a dog. perfect location for catching the ferry. My stay was just awesome! Best hostel I ever stayed at. Facilities were great. Kitchen excellently equiped. Whole bathroom to yourself when in use so all the privacy you may desire when using it. Common areas great with an exceptional view. Public transportation is not frequent on the island. If you don’t have your own transportation you have to put in some effort to get around. I did just fine though with buses and hitchhiking. Buses stop anywhere to pick you up by the way as long as it is possible and safe. One night stay for myself and wife, absolutely loved it. Friendly staff, great facilities, we will definitely stay again. Stay for more than one night!